I have an improved Midland farm. The land was valued unduly high as compared with the Government land. I hold 434 acres. The real value is about £3 10s., whereas I am charged £4 15s. It would be a help if the Company extended the payments over a longer term. My cropping operations have been successful. My yields have been 18 bushels the first year, and 20 bushels this year. I had in 130 acres the first year and 285 acres this year. I like the country and the prospects." "The chairman of the road board is Mr R. Robertson, who settled in the district immediately after his arrival from Scotland in 1915. Before leaving the old country he had been a colliery manager. This is his second year in the chair of the board, and he is also chairman of the local show committee. Mr Robertson owns about 1,700 acres, of which 600 are under wheat. On 900 acres he carries, roughly, 750 sheep, from which he forwards fat lambs to the metropolitan market." "The energetic chairman of the Carnamah Road Board is Mr. R. Robertson - a Fifeshire man. Fifteen years ago he came out from Scotland where he had been a mine manager, to take up a block of 430 acres at Carnamah under the Midland Railway Co's improved farm scheme. He knew precious little about agriculture then, but he was well imbued with Scotch determination so that today his farm is more than twice as large as when he acquired it and his knowledge of wheat farming considerable. He is one of the most prominent public men in a progressive community. When the road board was constituted in 1923 he became secretary for two years, only to be elected a member on his relinquishing the post. He has been chairman for two years. He is also chairman of the agricultural society and the parents' and citizens' association." "Quite a gloom was cast over the Carnamah district on Thursday evening by the news of the death under very sad circumstances of Mr. R. Robertson, a very well known and highly respected resident of the district. It appears that Mr. Robertson was out shooting parrots when he slipped on a small drain, falling forward on his gun, and the charge entered his head, inflicting fatal injuries. An inquest was held on Friday morning before Mr. J. Bowman, J.P., Acting Coroner, and evidence was tendered by Dr. Rosenthal, Constable Street, and Mr. Charles Robertson, a son of the deceased. A verdict was returned that death was due to a gunshot wound in the head, accidentally inflicted by himself. Deceased, who was 58 years of age, came to Western Australia in May, 1915, from Scotland, with his family. He had during his residence in the Carnamah district, taken a very active interest in public affairs, and was highly respected by all who knew him. He was the chairman of the Carnamah Road Board. Only two or three months ago his wife passed away, and he himself had been seriously ill, having for some time been treatment in Perth. His property was about three miles out of Carnamah, and his son, Mr. Charles Robertson, and his daughter-in-law lived with him. The funeral will take place this afternoon at the Carnamah cemetery, following a service at the Carnamah Hall at three o'clock." "On Thursday last, Mr Richard Robertson, farmer, of Carnamah, was fatally injured in a gun accident. He was shooting birds around his house on the farm, when the gun accidentally exploded and caused his death. Mr Robertson has occupied the position of chairman of the Carnamah Road Board for some years, and was very highly respected by the local residents. He had resided in the Carnamah district for the past 27 years." "Deep general regret was felt throughout the Carnamah district on Thursday evening of last week (July 7th) when it was learned that Mr. R. Robertson had met his death in tragic circumstances. Mr. Robertson was Chairman of the Carnamah Road Board and was very well known and highly respected throughout the whole North Midlands. Mr. Robertson was out carrying a loaded gun, apparently for the purpose of shooting a dog that he intended to destroy when he tripped and fell to the ground. The jolt of his fall exploded the weapon and the charge entered the side of Mr. Robertson's head, inflicting fatal injuries. An inquest was held at Carnamah before Mr. John Bowman, J.P. Acting Coroner, assisted by Constable H. V. Street of Three Springs. Mr. N. M. Graham, Solicitor of Carnamah watched the interests of the relatives of the deceased. Mr. Charles Robertson, son of the deceased, described the circumstances leading up to his hearing the gun explode. On running to investigate he found his father lying in a heap on top of his gun where he had obviously stumbled and in doing so had jolted the weapon, one trigger of which was very light, and caused it to discharge. He knew of no reason which would lead him to suspect that his father contemplated taking his own life. Doctor Rosenthal of Carnamah gave evidence of having examined the body. It was his opinion that death was the result of an accident pure and simple. He had been treating Mr. Robertson for an internal growth for some time but of late he showed a marked improvement in all round health. Constable Street was also examined by the acting Coroner, who then delivered the verdict that death was due to gunshot wounds in the head, accidentally inflicted by deceased himself while out shooting. 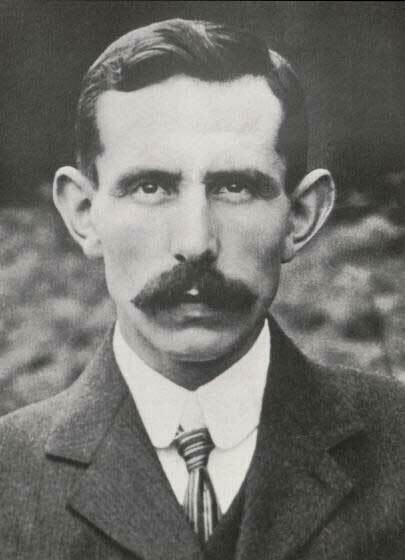 The late Mr. Robertson who was 58 years of age, came to Western Australia in May 1915, from Scotland, with his family. He had during his residence in Carnamah district, taken a very active interest in public affairs, and was highly respected by all who knew him. He was the Chairman of the Carnamah Road Board. Only two or three months ago his wife passed away, and he himself had been seriously ill, having for some time been under treatment in Perth. His property was about three miles out of Carnamah, and his son, Mr. Charles Robertson , and his daughter-in-law lived with him. The funeral took place on Saturday last in conjunction with that of the late Mr. C. Brewer." "The burial of Mr. Robertson and Mr. Brewer took place in conjunction on Saturday, July 9th, and it is estimated that no less than one hundred cars formed the impressive cortege. A Church service was conducted at Carnamah by the Rev. A. W. Curtis, Anglican Rector and Paster Barnes of the Presbyterian Church at 3 p.m. The funeral then proceeded to Winchester, arriving there at 3:45 p.m. The concluding portion of the service for Mr. Robertson was then taken by Mr. Barnes. The chief mourners were Mr. and Mrs. C. Robertson." "Hushed into a spirit of deep gloom with the news of the sudden death of Mr. R. Robertson, chairman of the Carnamah Road Board and a prominent public character in other respects, who was killed at his home as the result of a shotting accident on Thursday afternoon of last week, residents of Carnamah and the surrounding districts were stunned and horrified on the following day when it became known that Mr. Charles J. Brewer, licensee of the Carnamah Hotel, had been found dead in his bedroom, to which he had apparently retired during the afternoon for a brief rest. The remains of both the deceased gentlemen were laid to rest in the local cemetery on Saturday last, being followed to the graveside by a large cortege of people numbering approximately three hundred, who were conveyed in a long procession of over eighty motor vehicles. The Late Mr. Robertson - An Active Public Citizen - At the time of his death, particulars of which are contained elsewhere in the report of a coronial inquiry, the late Mr. Robertson was 58 years of age, having come from Scotland to Western Australia during 1915, afterwards settling on the land at Carnamah, in which centre he quickly gained the respect and admiration of everyone privileged to come in contact with him. Taking an active part in public affairs generally, he was subsequently elected to the office of chairman of the Carnamah Road Board. A position that he retained and fulfilled with credit to himself for a number of years. He was a prominent member of the masonic fraternity, and members of several lodges present at the funeral, including Mingenew and Carnamah, combined in paying a last tribute of respect and regard at the graveside. Only a few weeks ago the late Mr. Robertson was called upon to follow the remains of his wife to the grave, being then in a feeble state of health himself. When his death occurred, although unable to resume his former public activity, the deceased gentleman had recovered to the extent of being able to move about, but he was still far from strong. He is survived by one son (Mr. Charles Robertson), who with his wife lived with his father at "Woodbine Farm," and for whom the deepest sympathy has been expressed in his double bereavement. A Memorable Funeral - Impressive Services At Carnamah Hall - Early on Saturday afternoon motor cars began to take up a stand in the man thoroughfare of the town, and punctually at 3 o'clock a large crowd quietly filed into the Carnamah Hall, where a combined service was conducted by the Rev. J. Barnes (Presbyterian Church) and the Rev. A. W. Curtis (Anglican Church), the former gentleman officiating in conjunction with the burial of the late Mr. Robertson. Covered with beautiful floral tributes, the two caskets flanked on either side a table at which the clergymen took up positions and conducted a most impressive service. With Mr. G. K. Ryder as accompanist, the large congregation joined in the signing of "Lead, Kindly Light" and "Abide With Me," both hymns being rendered with feeling emphasis. The long cortege then commenced the journey to the cemetery situated about eight miles from Carnamah. On arrival the cars were parked on each side of the road to form an approach to the burial ground, and the people they had conveyed wending their way to the graveisde formed a memorable and touching sight, and proved a striking illustration of the respect and esteem in which the deceased gentlemen were held in the district. The casket containing the remains of the late Mr. Robertson having been committed to the grave by the Rev. J. Barnes, mourners remained quietly around the open grave whilst the bearers conveyed the other casket to its last resting place. The crowd then moved to the second grave, where the Rev. Curtis conducted the burial rites of the Anglican Church over the body of the late Mr. Brewer. Everything was admirably orderly, there being no hitch or haste in any instance, a beautiful and touching solemnity befitting the occasion being preserved throughout. At the conclusion of the ceremonies the mourners quietly and reverently dispersed, leaving the earthly remains of the relative, friend or fellow citizen to rest in peace, free from pain and free from care, but leaving by such freedom vacant places and lonely hearts behind them. The pall-bearers for Mr. Robertson's funeral were Messrs. A. C. Bierman, A. A. McGilp, J. K. Forrester, J. S. Rooke, J. Bowman, J. Lang, sen., C. W. Turner, A. W. Hollingsworth and G. K. Ryder, the gentlemen officiating in a similar capacity for the burial of the late Mr. Brewer being Messrs. G. F. Brown, J. Harmer, W. Sheridan, A. B. Gloster, R. C. Drage, H. Street, N. McKenzie and Dr. C. P. Rosenthal. The pall-bearers included representatives of the Carnamah Road Board, the Carnamah Agricultural Society, the Carnamah Masonic Lodge, the Carnamah Race Club, the Carnamah Rifle Club, the Carnamah Football Club, and other organisations. The chief mourners for the late Mr. Robertson were his son and daughter-in-law (Mr. and Mrs. Chas. Robertson), the late Mr. Brewer being mourned at the graveside by Mrs. Brewer (widow), Miss Adeline Brewer (daughter), Mrs. McKenzie (sister), and N. McKenzie (brother-in-law). As a mark of respect to the deceased gentlemen all the business houses of Carnamah were closed for a period of three hours during the afternoon of the funeral." "My maternal grandfather (William Robertson) was a younger brother of Richard Robertson. Richard married Jane Syme in 1896 (birth name Forrester; she adopted her natural father's name later) in Dundonald, Auchterderran, Fife, Scotland at the age of 22. He was a coal miner. By 1901 he had been promoted to Colliery Overman, the second stage up the management ladder (the first being Fireman). At that time he and his family (Jane and son Charles) were living in Block 5, Denend, Auchterderran. Denend was less than a mile away from Dundonald. By 1911 he was living with his family in Bothwell, Lanakshire, Scotland in Aitkenhead Cottages. He was by now Colliery Manager. Quite a leap to buy a farm in Australia in 1915! However, the life and conditions in coal mining towns back then were appalling.He also had a younger brother, John Stanley Robertson who also emigrated with his family in 1926, but to New Zealand. My grandfather went to South Africa to check out life there, with two brother-in-laws to assess prospects of bringing their families out. Disaster. In a coal mine north of Jo'burgh an explosion killed one of his brother-in-laws and disabled his other for life. He survived unscathed, and retreated home to Auchterderran."